This worksheet has a grammar guide. Students check their understanding of the rules by doing a T/F exercise. They practise with matching and m/c exercises. The grammar item is zero condtional only. 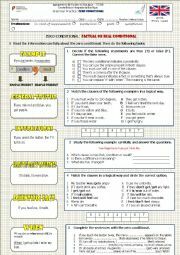 This worksheet has a grammar guide featuring relative pronouns. The students do a matching and then a multiple choice exercise. 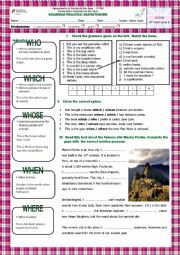 Finally, they complete a text about the ancient site Machu Picchu with relative pronouns. 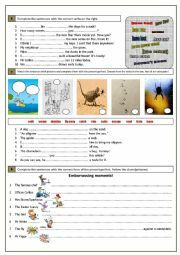 Students check an extensive grammar guide and do a variety of exercises based on pictures/cartoons with focus on rules, form and use. This worksheet has two pages but I need to upload them seperately because of the size. 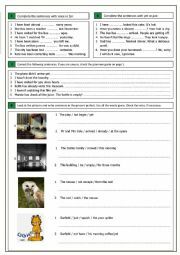 This is the second worksheet on the present perfect. I�ve divided it because it�s too big to upload. It has a grammar guide for the form and use of since and for, ever/never, yet, just and already. Students check their understanding of the rules based on pictures. Students choose the correct verb and fill in the gaps using the past continuous form, according to the pictures. There are two pages, for two teams. Key is included. This is the second part of the second worksheet on the present perfect. 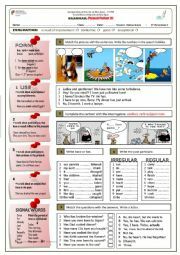 Students practise and consolidate this grammar item. The last exercise is based on pictures. This is the second page of the previous worksheet (present perfect). Students watch a video from biography.com about Charlie Chaplin�s childhood and his career in the fim industry. They need to fill in a spidergram. Then they complete a text and later do a T/F exercise, answer reading comprehension questions and work on interpretation. The other video files can be found on youtube quite easily. 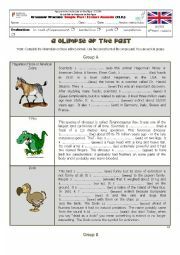 As students read about extinct animals, they fill in the gaps with the simple past form of the verbs given, both regular and irregular. They can work in groups. 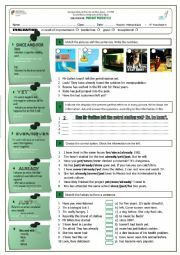 Students infer the use and form of the present perfect with �already� and �yet� based on pictures. Then they make sentences based on visual clues and on given words. This is the second part. 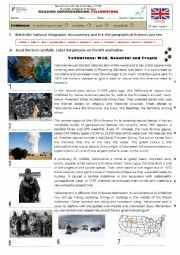 This ppt is about present perfect with �just�, first part. It helps students infer the rules and then they can do a sentence completion exercise based on pictures. 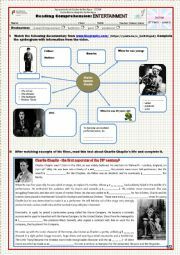 This ppt is about present perfect with �just�, second part. 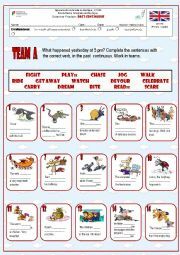 It helps students infer the rules and then they can do a sentence completion exercise based on pictures. The context is set with a short video and later with a photograph, showing an example, followed by a grammar guide. Then students are asked to write sentences using the present perfect with since or for based on clues and photographs.